It's that time again! The Northern Monkey and myself are afield in search of, I know this sounds unlikely, vegetables. Our perennial favourite is Wild Garlic/Allium Ursinum, aka ramson, jack-in-the-hedge, buckrams, wood garlic, and where applicable, ‘bear’s garlic’. This year we've upped our game and so far have collected three rubbish sacks full. One for the 'Trophy Room' or as you may know it chest-freezer, and two for our favourite preserve. 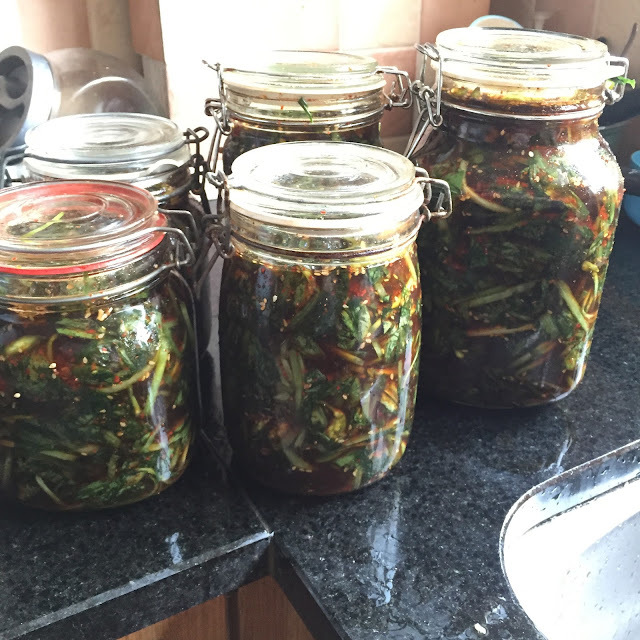 Salads and Omelettes aside our favourite way to eat wild garlic, has long been KimChi. We're now in year four of Kimchi making and have a few tips to pass on. South Korea consumes 1.85 million metric tons of kimchi annually, or nearly 80 pounds a person. I wouldn't dream of preparing any foraged food stuffs without recourse to Hunter, Angler, Gardener, Cook, the website of my wild food guru Hank Shaw. Look up any game or foraged food and Hank has blazed a trail. In this instance Hank is fermenting with Ramps (Allium tricoccum) which from the picture look a little closer to the Spanish Calçot, so he neatly folds the green fronds over the white stems. Hank also cooks by weight - we cook by volume - so you'll be better off following his proportions. Two bin bags worked out to roughly 44 litres of leaves, stems, buds, and flowers. We add liquidised Ginger - lots - the biggest, freshest root in the asian supermarket - the stuff in the regular supermarket is crap. Sesame Seeds 500g/1.1lbs - last bag in the shop. Korean Pepper flakes 250g or a whole jar. Hank adds a couple of spoons of sugar, lots of people forego the sugar and use a liquidised Pear or an Apple. Both have worked well for us. We add rice flour, beaten into some boiling water, allowed to thicken and then cool, wizzed up with the Ginger, to give the ferment a head start. After we've given it a rinse in cold water, we Brine the chopped leaves to kill off any other bacteria that might be malingering. For the Brine - 1 cup of salt to 5 cups of water. the other advantage is once the brine has taken affect, you can see at a glance that the leaves and stems have decreased in volume, they'll also become a bit darker and intensify in flavour. VERY IMPORTANT rinse and rinse again, in year two we didn't rise nearly enough and the Kimchi was way too salty. VERY IMPORTANT Kikkoman is the minimum bid for Soy sauce, if you use that Chinese crap or the rubbish the supermarkets pass off as soy sauce, you literally only have yourself to blame. "If a Korean goes to space, kimchi must go there, too, without kimchi, Koreans feel flabby. Kimchi first came to our mind when we began discussing what Korean food should go into space." Kim Sung Soo, a Korea Food Research Institute scientist. A week or two seems to be the online consensus for how long it takes to let the ferment do its work. I'd say it was edible from this point but, longer is stronger. I've got kimchi in my fridge that's well over a year old, it's fierce. While most sources will point you in the direction of well established woodlands, Wild Garlic is a marker species for ancient woodlands, our main collection areas are by steams - wild garlic loves damp ground. I'd always associated it with shady forrest floors, but 'up north' its growing in bright sun light on the banks of a stream. Follow your nose, you'll find it.